Copyright © 2019, Air Boca. All Rights Reserved. Living in South Florida is great –– from food to entertainment to nature spots, our slice of paradise has it all. But if you’ve ever lived through a South Florida summer, you know that the heat can feel unbearable. That’s why it’s important to find a reliable air conditioning company that specializes in residential AC services. You never know when you’ll need a fast repair or a reliable installer, and Air Boca knows how stressful the search for the perfect contractor can feel. We have made our customers our top priority, and we haven’t sacrificed employee satisfaction in the process. The Air Boca team is a family, and we’re the top air conditioning company in South Florida for a reason. We provide air conditioning installation, maintenance, and repair. Air Boca installs everything from pool heaters to smart thermostats, along with large-scale projects like central air and water heater installation. After installation is complete, you’ll need to create a maintenance schedule, and we’ll help with that, too! Regular maintenance is essential if you want to keep your air conditioning system in top condition, and Air Boca can handle all maintenance tasks ranging from simple to complex. If your air conditioning system malfunctions or something goes wrong with an air conditioning or heating product, you’ll want to get an expert opinion ASAP. We know that your home is a place of sanctuary and relaxation, which is why it’s important to keep it comfortable! When you’re dealing with air conditioning issues, your home can feel intolerable. We work around-the-clock because we want to help you return to normal as soon as possible. Quality is a priority, which is why we only work with brands and manufacturers that are trusted industry-wide. There’s no place like home, so why not make your house as pleasant as possible? 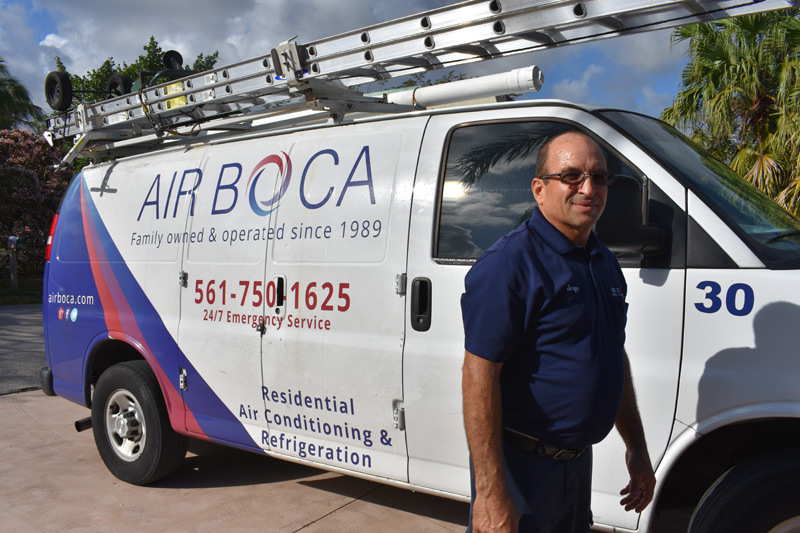 If you need home AC repair, installation, or maintenance and you’re located in Palm Beach or Broward County, Air Boca is the company to call. Want to keep your HVAC running well year round but confused with Air Conditioning lingo? 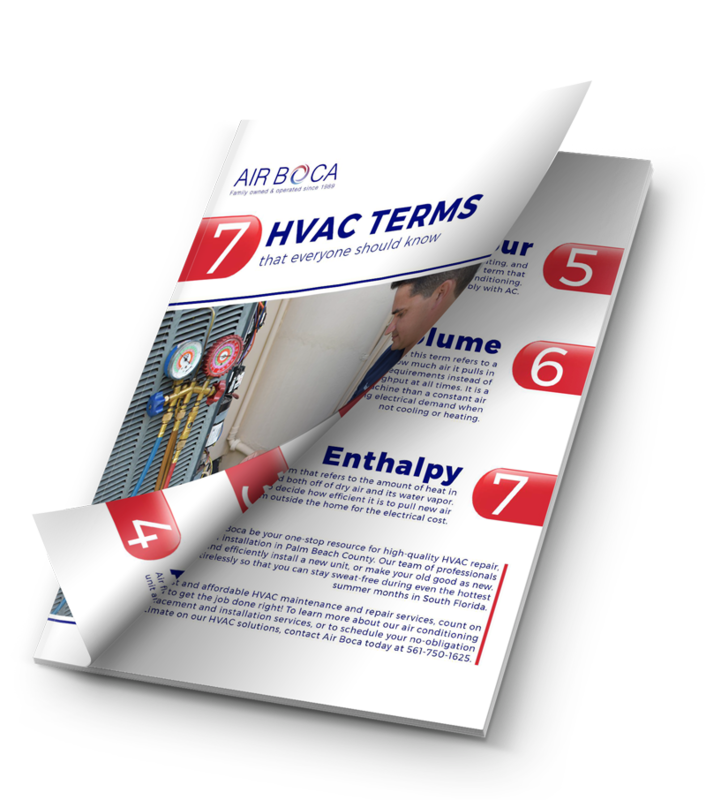 We’ve got you covered with this dictionary of 7 HVAC terms everyone should know! Want to learn more about our Residential AC Services? Residential AC Services Overall rating: 5 out of 5 based on 10 reviews.